How you handle crisis is the mark of a true leader, I am not sure what we are witnessing with the Donald currently inhabiting the White House. As Hurricane Florence hammers the east coast, the United States Commander in Chief had this brilliant piece of information to tell us. Yes you heard that right. The best/worst part of this is he filmed that. He could have, or someone on his staff could have, just called cut and filmed another take. I am guessing they figured that was the pinnacle, the best they were going to get, so they moved on. Now that we know the Hurricane is wet from the standpoint of water, what's next? Sorry you asked! The Donald decided to do a photo op by handing out food to displaced residents and told them to "have a good time". The Donald, in true David Dennison fashion, was actually able to Trump that, he told one victim of Hurricane Florence - "At least you got a nice boat out of the deal". According to White House pool reports, Trump spoke with an older man standing in front of a small brick house, behind which was a large yacht that had washed ashore and was shipwrecked against the man’s wooden deck. 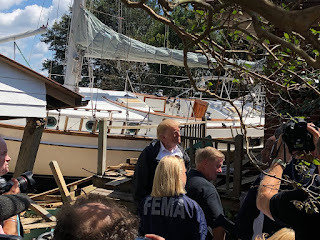 When asked if this was his boat, the man told Trump, “no.” He went on to complain to the president that his insurance company didn’t want to pay for the damage to his home from the storm. “They don’t know whose boat that is. What’s the law? Maybe it becomes theirs,” he added. People are going to have a very hard time explaining to their grandkids how we ever allowed this imbecile anywhere near the White House. For the record(and my grandkids): I never have and never would vote for him!